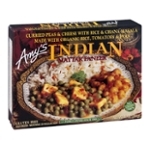 Organic Basmati Rice, Organic Onions, Organic Peas, Organic Garbanzo Beans, Filtered Water, Paneer Cheese (pasteurized Milk, Calcium Chloride, Distilled Vinegar [gluten Free] And/or Citric Acid), Organic Diced Tomatoes, Organic Tomato Puree, Expeller Pressed High Oleic Safflower And/or Sunflower Oil, Spices*, Organic Carrots, Sea Salt, Organic Garlic, Organic Cornstarch, Turmeric, Paprika. *100% Pure Herbs & Spices (no Hidden Ingredients). No Preservatives.